The 1984 United States presidential election in North Carolina took place on November 6, 1984, and was part of the 1984 United States presidential election. Voters chose 13 representatives, or electors to the Electoral College, who voted for president and vice president. 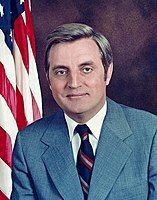 North Carolina strongly voted for the Republican nominee, President Ronald Reagan, over the Democratic nominee, Vice President Walter Mondale in a landslide. The final margin was 61.90% to 37.89%, which compared to the other southern states, was close to the southern average. This margin was a huge swing from 1980, where Reagan had only narrowly carried the state. No Democrat would win in North Carolina again until 2008. As of the 2016 presidential election[update], this is the last election in which Vance County, Chatham County, and Scotland County voted for the Republican candidate. ^ "1984 Presidential General Election Results -North Carolina". Dave Leip's U.S. Election Atlas. Retrieved 2008-08-25.